Stairs at St. George Station. Photo by Jason Cook from the Torontoist Flickr Pool. For me, public transit has always meant freedom. After living my high school years in the boonies, with only a handful of other houses, a general store, and town a 20-minute drive away, to say I was excited to go away for college is an understatement. After living in Ottawa to attend Algonquin College in 2008, I learned what it’s like to get around with relative ease, to hop on a bus to get to a movie theatre or mall without any aid. In 2011, I moved to Toronto and lived in residence at Ryerson University. Again, I was surrounded by public transit. But there were pitfalls, and though I live with a moderate form of Cerebral Palsy that allows me to walk with two canes, I found myself struggling to get around the city. Five years later, the TTC still isn’t completely accessible for Torontonians, like me, with disabilities. As it stands, 34 of Toronto’s 69 subway stations are currently accessible—that is, they each have accessible entrances, fare-gates, and elevators. 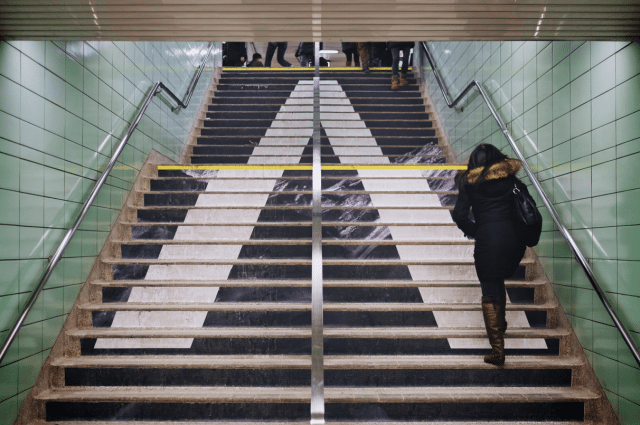 The Commission has plans to update all remaining inaccessible stations by 2025, per the Accessibility for Ontarians with Disabilities Act (AODA) requirements. I’m lucky that I can use my canes to walk up stairs when necessary; but many, like those who use wheelchairs or walkers, don’t have that option. If an individual with a wheelchair needs to be in the Wellesley or College area, for example, he or she has to commute from Dundas or Bloor stations, which each have elevators in service, or arrange alternative transportation, such as a bus or Wheel-Trans. At best, the inaccessibility of these stations is inconvenient. At worst, it hinders many from getting to where they need to go, and reinforces the embarrassment that is associated with an inability to act independently. Matt Hagg, senior planner of system accessibility, recently assured me in an email that the TTC is on track to meet the 2025 goal. The current schedule has St. Clair West and Ossingtion stations as a priority for 2016, with Woodbine and Coxwell following in 2017. Warden and Islington will be the last stations brought up to standard because they are two of the most complicated reconstructions, with multiple bus bays, each with their own staircase. Accessible station priorities are made with the consultation of the Advisory Committee on Accessible Transit (ACAT) and within the requirements of the AODA. Criteria for such priorities include: proximity to health care and education, demographics, transit connections, ridership, and location. These criteria were last re-affirmed in March 2013, with Old Mill Station, considered then to have the lowest ridership, as the point of reference. ACAT meets publicly once a month at TTC headquarters, providing advice to the TTC board and staff on issues of accessibility, representing seniors and people with disabilities in Toronto. The committee has four sub-committees that looks even more closely at Wheel-Trans, communications and customer service, planning and training of staff, and the design and planning of TTC stations and vehicles. “ACAT’s input is highly valued by TTC staff,” says Hagg, “and many accessible features of the TTC stem from the advocacy of ACAT.” Blue priority seats, written descriptions of TTC stations for people with vision impairments online, and improvements to the subway platform edge at Eglinton Station to minimize the gap between trains and the platform are just some examples of service improvements ACAT has initiated. ACAT is also consulted about PRESTO, which recently reached two million customers. While I agree that the system has the makings to be a highly accessible option—it is much easier than trying to mange coins or tokens—I was concerned when I noticed that PRESTO machines at accessible stations were not consistently placed at accessible fare gates. Vanessa Barrasa, senior advisor, communications and public affairs, wrote in an email that Metrolinx is committed to accessibility and will continue to seek feedback and make adjustments with future updates of machines and software. The TTC, however, is responsible in the placement of PRESTO machines. Hagg says PRESTO will be available at each station by the end of 2016, and at every fare gate by mid-2017. Still, the process can feel incredibly slow for those in need of accessible transit options. According to Hagg, a typical station accessibility project takes five years to complete: two years to design and three spent in construction. This, he says, is a complex process due to property requirements, electrical upgrades, and third-party stakeholders. When it comes to property requirements, Hagg said most stations need property acquisitions, easements, or development contracts from outside parties, all of which requires a lot of coordination and cooperation from the City and anyone else involved, taking up to two years per station. Electrical upgrades, required for elevators, involve the help of Toronto Hydro, which can be challenging to schedule as the utility company already has a full plate of competing priorities. This is all made more challenging, Hagg points out, by the fact that most stations are underground, meaning that elevator construction requires major relocations and evacuation—all while still maintaining service to get people where they need to go in the most efficient way possible. Above ground, meanwhile, the 510 Spadina route is mostly run by the new accessible streetcars. But progress is being made: the 509 and 514 Cherry streetcar routes are scheduled to be accessible towards the end of 2016. And by June 19, the 72 Pape bus route will be extended to Union Station. This could increase accessibility for some by eliminating the need to transfer between subway lines. Looking back on my youth spent without access to transit, I recognize that my situation in Toronto could be much worse. But the TTC must continue to prioritize accessibility for commuters like me. In the meantime, we’ll continue our nine-year wait for full station accessibility across the city. It may be a long wait, but it’s an important one. CORRECTION: May 31, 10:01 AM An earlier version of this article indicated that the 514 Cherry streetcar would be accessible by June 19, and the 509 streetcar is accessible. These routes are projected to be accessible towards the end of the year, depending on the availability of the new streetcars from Bombardier. See Steve Munro’s comment in this article for more details.